1. Showcase Iowa’s beef cattle genetics, feedyard management, and modern technology. 2. Offer Iowa’s cattle industry a fun and competitive statewide fed-beef contest to highlight Iowa’s beef production advantages. 3. Provide leadership and learning opportunities through the ICA Young Cattlemen's Leadership Program (YCLP). 4. Generate additional non-dues ICA revenue to grow Iowa’s beef business through advocacy, leadership and education. Each November, steer-sponsors donate 700 lb. steer calves to compete in this prestigious Iowa fed-beef contest. Steers complete 180-200 days on feed to an average 1,400 lb., market-ready end point. Cash prizes and special awards are presented to contributors of the Top 10% of individual steers based on the “Retail Value per Day on Feed,” recognizing both feedyard performance and end carcass merit. In 2018, a $5,000 cash prize will be paid to the Champion Steer donor(s). Awards for outstanding individual carcass results will also be presented. Every effort is made to deliver maximum cattle efficiency, carcass value and net revenue of all steers. From July to October, YCLP members recruit steers for the contest. Individual ICA members, allied businesses, county associations and other entities have generously donated steers to compete for “Iowa’s Best Beef Carcass” steer honors. ICA is celebrating the conclusion of the 8th successful year of the Carcass Challenge program. Over the years, many cattlemen from around the state have contributed calves to this fed steer contest to support ICA and see how their cattle stack up. Showcase Iowa’s beef cattle genetics, feedyard management, and modern technology. Offer Iowa’s cattle industry a fun and competitive statewide fed-beef contest to highlight Iowa’s beef production advantages. Generate additional non-dues ICA revenue to grow Iowa’s beef business through advocacy, leadership and education. Provide leadership and learning opportunities through the ICA Young Cattlemen’s Leadership Program (YCLP). Each November, sponsors donate 700 lb. steer calves to compete in this prestigious Iowa fed-beef contest. Steers complete 180-200 days on feed to an average 1,400 lb., market-ready end point. Cash prizes and special awards are presented to contributors of the Top 10% of individual steers based on the “Retail Value per Day on Feed,” recognizing both feedyard performance and end carcass merit. 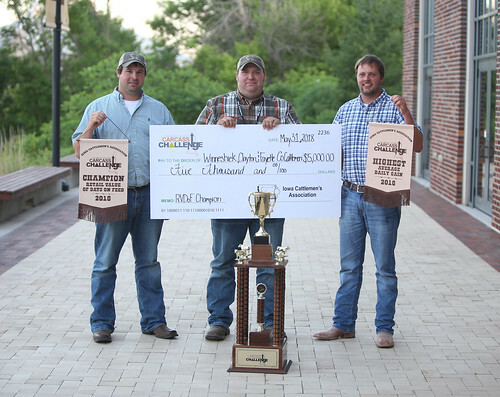 A $5,000 cash prize is awarded to the Champion Steer donor(s). Awards for outstanding individual carcass results are also presented. Every effort is made to deliver maximum cattle efficiency, carcass value and net revenue of all steers. This year, 75 steers were entered into the contest from various breeders across the state with several different breed compositions represented. The steers were delivered in November and harvested at the Tyson plant in Dakota City the last week of April. “We were excited to work with Kennedy Cattle Company of Atlantic, Iowa to feed the steers again this year,” says Casey Allison, Iowa Cattlemen’s Association staff. “Throughout the testing period, we collected data on the growth progression of each animal by utilizing ultrasound technology, EID’s and recording weights on test, at the interim period and off-test weights.” Steer donors and YCLP participants received regular communication throughout the test via email to stay up to date on progress in the feedyard. The expertise and guidance of David Trowbridge and Faye French with Gregory Feedlots alongside Matt Groves with the Tri-County Steer Carcass Futurity enabled ICA to provide more in-depth data analysis, building on one of the program’s core goals - sharing educational information with donors. In addition to several performance tabulations, charts and graphs show donors how the cattle performed, both individually and compared to their pen mates. This provokes conversation about how and why the management decisions from birth to harvest impact how or if an animal maximizes its genetic potential. Thanks to the program’s primary sponsor, Elanco, for donating the animal health products, Tri-County Steer Carcass Futurity Co-op for facilitating data collection at the plant and assistance with marketing, Kennedy Cattle Company (Zak and Mitch Kennedy) for feeding the steers, The CUP Lab for interpretation of the ultrasound scan images, Shnurman Sire Services for ultrasounding the steers, Thielen Trucking for hauling the cattle to the plant, and FNB Bank for sponsoring breakfast at our Open House. As in years past, the Carcass Challenge proved that Iowa is a national leader in producing and feeding high quality cattle and beef. Comparing this year’s Carcass Challenge steers to the national benchmarks from the 2016 National Beef Quality Audit, 7% more of the cattle graded as yield grades 1, 2 or 3 compared to the national average while nearly 50% fewer Carcass Challenge steers were marked as yield grades 4 and 5. As yield grade correlates to value, these figures speak to the economic advantage Iowa cattle offer. When it comes to quality grade, an overwhelming 81% graded prime or choice compared to the national average at 71%. There were 34% fewer steers that fell in the select or no roll category. The top gaining steer averaged 5.5 pounds per day, the highest marbling steer had a marbling score of 734, and the overall winner marked a Retail Value per Day on Feed of an extremely impressive $7.52. This is a true testament that not only can Iowa cattle compete, but they can and do lead the way nationally. Retail Value per Day on Feed: The program awards cash prizes to the top 10% of steers for Retail Value per Day on Feed. This is a dollar value that accounts for hot carcass weight, percent retail product, carcass price, and days on feed, balancing the important factors that ultimately drive profitability. Raised by Collison Angus; sponsored by Collison Veterinary Service of Rockwell City and Lytton Farm Equipment - The 2nd place steer is a January born registered Angus steer sired by EXAR Denver. He recorded an Average Daily Gain of 4.99 pounds and went off test at 1611 pounds. This steer graded Choice and qualified for Certified Angus Beef for a $52.29 premium and maintained efficiency with a 6.24 feed to gain ratio. This steer marked a Retail Value per Day on Feed of $6.80. RL Fleckvieh, B&B Farm Store, Buchanan County Cattlemen’s Association, and Winthrop Vet Clinic - Placing 3rd is a Simmental/Red Angus/Fleckvieh cross steer with a yield grade 1 and quality grade of choice that captured a $64.22 premium. He had a ribeye area of 16.53 inches. This steer gained an average of 4.38 pounds per day and hung a 988 pound carcass. He boasts a Retail Value per Day on Feed of $6.78. Raised by Longinaker Farms, sponsored by Longinaker Farms and the Taylor County Cattlemen’s Association - The 4th place steer is by an Angus bull and out of a Red Angus cow. Born in March and weaned in September, he entered the test period at 720 pounds and went off at 1374 pounds, giving him an Average Daily Gain of 4.61 pounds. Another yield grade 1, Choice steer, this steer’s data shows a $6.63 Retail Value per Day on Feed. Raised by Lawton Simmentals, sponsored by Lawton Simmentals and the Greene County Cattlemen’s Association - In 5th place is a Simmental steer born in March that was creep fed before weaning in August. He gained an average of 4.59 pounds throughout the test and gained exceptionally well especially in the first half of the test period gaining almost 5 pounds per day. At slaughter he received a $58 premium as a yield grade 1 and quality grade choice with a 16 inch ribeye. This steer’s Retail Value per Day on Feed came out at $6.60. Raised by Jeff Cook, sponsored by the Carroll County Cattlemen’s Association - Placing 6th is an April born steer sired by a Charolais bull and an Angus cross cow. This steer was not creep fed, but entered test at 871 pounds and gained an average of 4.42 pounds per day. A yield grade 1 and quality grade choice, he had a ribeye area of 16.54 inches and showed a Retail Value per Day on Feed of $6.50. Pixley Family Simmentals, Sterling Family Cattle Company, and the Iowa Simmental Association - Placing 7th is a Simmental steer born in April. He was creep fed and weaned in early September and went on test at 912 pounds. He gained an average of 4.27 pounds per day and weighed 1519 pounds when he went off test. He recorded an impressive ribeye area of 16.83 and had a Retail Value per Day on Feed of $6.45. Highest Average Daily Gain: raised by Radloff Angus in Luana, Iowa and donated by the Winneshiek, Clayton, and Fayette County Cattlemen. The winner is a purebred Angus steer that went on test at 783 pounds and went off test at 1566 pounds, giving him an Average Daily Gain of 5.5 pounds. Largest Ribeye Area: Bloomfield Livestock Auction and Schooley Cattle. The winner had a ribeye area of 18.24 inches, which is all the more impressive when compared to the national average of 13.9. He is a March-born simmental steer sired by LLSF Pays To Believe. Highest Marbling Score: Brian McCulloh, Woodhill Farms. An Angus, March-born steer, he scanned an impressive intramuscular fat percentage of 8.66% which converts to a marbling score of 734 which qualifies as slightly abundant. Unsurprisingly, this steer graded prime for a $66.92 premium. Chef’s Award: Brian McCulloh, Woodhill Farms. This award is presented to the steer with a 12 to 14 inch ribeye with the highest marbling score. Sired by Tehama Sierra Cut Z118, the winning Angus steer had a ribeye area of 13.71 inches and slightly abundant marbling with a %IMF of 8.66%. Thanks to our primary sponsor, Elanco for donating the animal health products, Tri-County Steer Carcass Futurity Co-op for facilitating data collection at the plant and assistance with marketing, Kennedy Cattle Company (Zak and Mitch Kennedy) for feeding the steers, The CUP Lab for interpretation of the ultrasound scan images, Shnurman Sire Services for ultrasounding the steers, Thielen Trucking for hauling the cattle to the plant, and FNB Bank for sponsoring breakfast at our Open House.